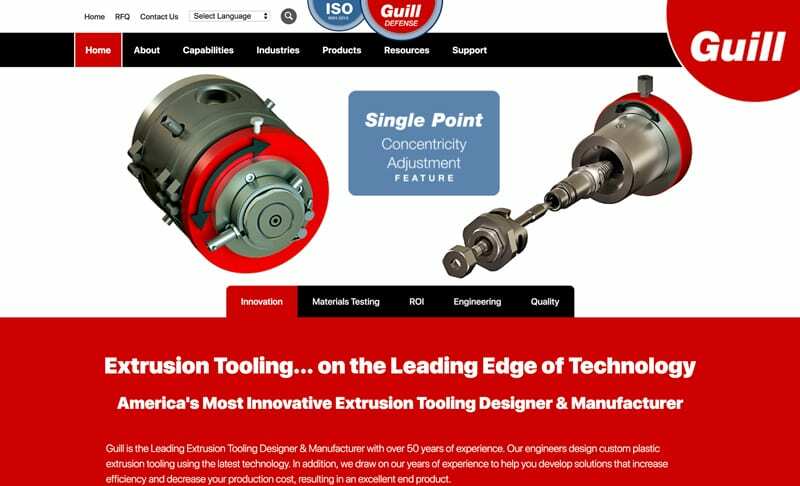 Guill Tool & Engineering, West Warwick, Rhode Island, world leader in extrusion tooling design and manufacturing, just rolled out a new website at www.guill.com. The new site offers a detailed look at the company’s entire product line, which offers a wide-range of standard and custom designed extrusion tooling, including crossheads, in-line heads, rotary heads and extrusion tips & dies. The site includes a full listing of all product and specifications with calculation tools to compute annual cost of lengthy concentricity adjustments and crosshead replacement analysis, plus calculators to compute draw-down, feet per minute and pounds per hour. The website includes charts and tables with detailed data and a full library of downloadable literature organized by industry. Guill markets its equipment worldwide and is currently seeking new representatives in select countries. The Guill website is mobile phone friendly and offers the convenience of allowing users to request a quote online. The new website has already been awarded the 2018 American Web Design Award from Graphic Design USA. 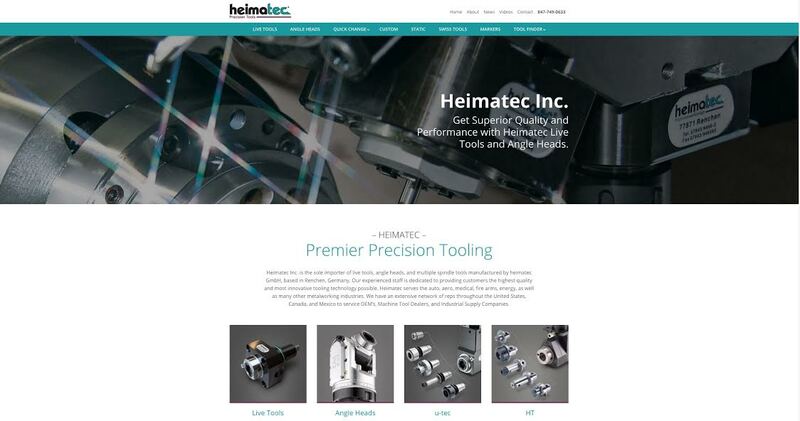 Heimatec, a market leader in live tooling for the North American machine tool industry, announced the rollout of its new website at www.heimatecinc.com. The new site offers an in-depth look at the company’s extensive lines of standard and machine brand tooling, including the new Tecnicrafts line of collets and guide bushings, specifically designed for the Swiss machine tool market. The site includes dozens of downloadable PDF catalogs, as well as an online tool search feature and videos of various live tool demonstrations. 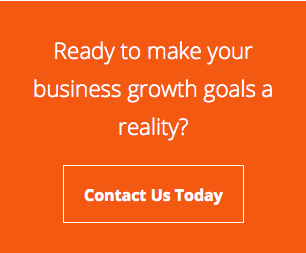 A “Contact” page offers customers the option to inquire directly from the site, and easy access to local manufacturer’s representative information. The site is easy-to-navigate and is mobile phone friendly. 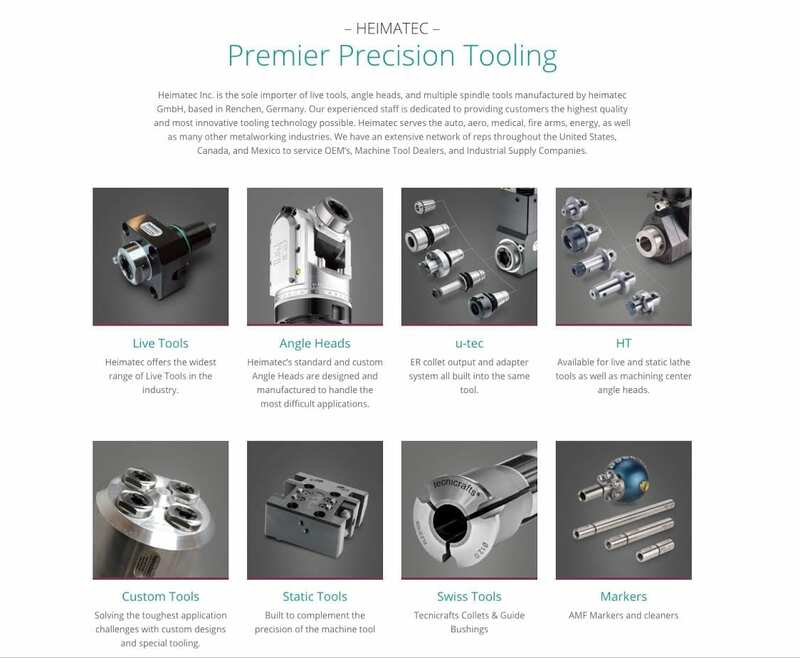 Also included in the website is a dropdown section on custom designed tooling, which Heimatec offers in addition to its standard tooling and machine brand specific line. Tooling experts work directly with customers to design solutions to suit specific requirements for all CNC lathes, helping to solve the most challenging applications in multiple markets served by the company. Heimatec tools offer the highest precision and most advanced technology available in the machine tool accessory market. The company is acknowledged as a world leader in live tools, angle heads and multi-spindle drill heads. With over 40,000 designs in its database, Heimatec offers the widest range of live tooling in the industry. Heimatec North American distribution headquarters are located in Prospect Heights, Illinois (Chicagoland area) with world headquarters and all manufacturing based in Germany. A team of manufacturers’ representatives covers the North American market for Heimatec. New Kastalon website features hundreds of standard polyurethane rollers, pads and sleeves for industrial applications plus the company’s custom capabilities. 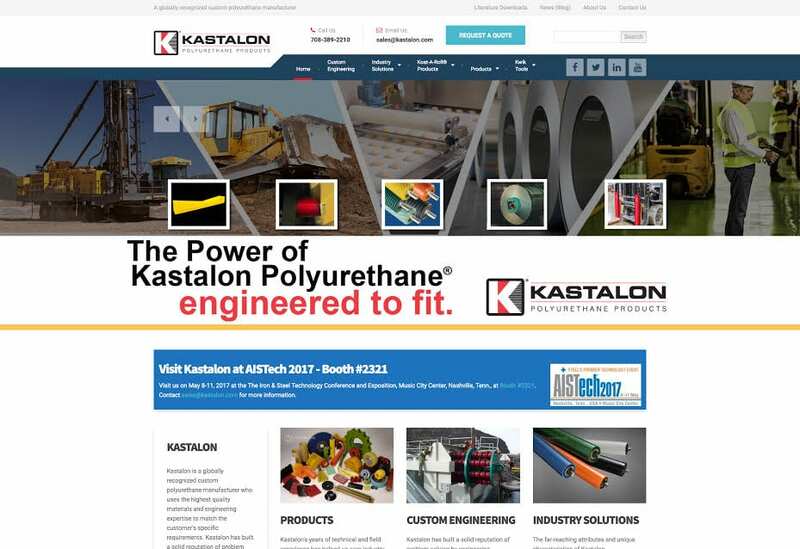 Kastalon, a longtime leader in polyurethane products, announces the rollout of its new website at www.kastalon.com. The new site offers a look at the company’s extensive lines of standard products, including rollers, pads, bumpers and sleeves for various uses in materials handling, metals producing and processing, as well as myriad other market applications. Likewise, this new website details the custom material formulation and production capabilities of Kastalon, as the company has built a reputation for problem-solving solutions, since its inception in 1963. Also included on the website are a number of engineering tools, which allow prospective customers an opportunity to detail their requirements for prompt quotation. Various materials performance calculation tools are provided on the site and these are among the most popular pages. Full company literature downloads are also offered. Kastalon brings its decades of manufacturing experience and application engineering to each customer task, providing a high degree of material consistency and product performance to the global markets served by the company.